From slavery to world-famous scientist! 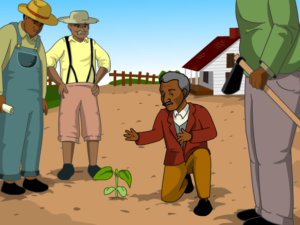 Dr. George Washington Carver, the brilliant botanist who struggled to get an education in the Jim Crow era. Childhood illness led Carver to a lifelong interest in plants. That hobby blossomed into a career as a scientist and an educator. To help farmers keep their soil healthy, Carver traveled throughout the South teaching the importance of crop rotation. He advised planters to alternate their usual crop with peanuts, which returns the essential plant nutrient nitrogen to the earth. To boost the market for peanuts, Carver developed hundreds of peanut-based inventions.